For Ty, losing Annie was heartbreaking. Still, he can't imagine life without the three-year-old son whose mother left him for Ty to raise. Ty wants it all; Annie, his child and the future he'd dreamed about; and he's back home in Serenity to fight for it. But getting Annie to forgive and forget may be the hardest challenge he's ever faced. With the stakes so high, this is one game he can't afford to lose. 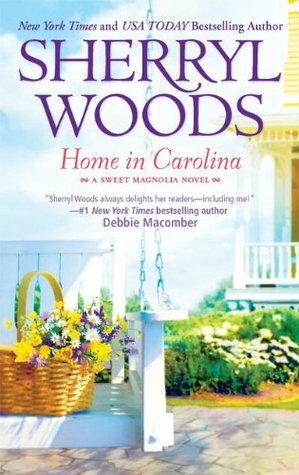 Home in Carolina is the fifth book in Sherryl Wood's Sweet Magnolia series. Like the previous ones I enjoyed it, although I had one reservation. We met Ty and Annie is the earlier books when Ty was struggling with his parents' divorce and his own promising possible future as a baseball player. Now he is back in town to recuperate from an injury and with him is his son Ty. Annie has recovered from her bout with anorexia, and is now a sports injury therapist at the local women's spa. When Ty returns she is not keen to meet up with him again because of his betrayal of her. However Ty is out to woo her and win her back, knowing their love is deeper than she acknowledges. Yet the appearance on the scene of the mother of Ty's son seems to throw a huge curve ball not only for Ty but for Annie too. I enjoyed the plot line and the addition of two of Annie's friends, between them they seem to be assembling a junior version of the Sweet Magnolias. I can see that Sarah and Raylene will most likely feature in future books. What I did quibble with a little was Annie, I just didn't enjoy her on again, off again attitude. Sure she had some reason to be cautious but I think the time was long past for that and it was time to be there for Ty. I think I'll read her Ocean Breeze series (which I have) before I splurge on any more lol. 5 books in and still enjoying them, that's something! I am two books in on her Ocean Breeze series, and have third on shelf. But decided to go with the Sweet Magnolias first. I think that some of them have the older women which I like, although this one went towards the younger ones. They are gentle nicely written reads!